she raises her arms above her head (picture a football referee’s ‘Touchdown’ pose), slaps her knees hard twice, and then clutches her tummy with her hands. She lurches forward. She returns to an upright position, still laughing. Pure joy from Ella Joy. Ella Joy Won, now 9 and a fourth-grader, was diagnosed with Non-Hodgkin’s lymphoma when she was 4. In 2017 she found out she had leukemia. Leeson, now a senior at LFHS, and her classmate Katie Abdallah, another visitor to the Won household on the day that video was shot, are members of Battle Buddies, a nonprofit launched from the school’s Business Incubator program at the start of the 2017-2018 academic year. Its mission seeks to raise the spirits of pediatric cancer patients by pairing them with young adult volunteers biweekly. Battle Buddies considers each pediatric cancer patient a trooper. The organization’s first trooper was Ella Joy, in remission today. Pediatric cancer patients and their families welcome distractions, seek distractions, because they often bury the burdensome thoughts of cancer and the lingering fear and anxiety before that next chemotherapy session—or tomorrow’s radiation therapy session. Leeson and Abdallah have served, happily and consistently, as Won’s wonderful distractions 12 times since early 2018. Another Battle Buddy, LFHS senior Ashley Bufe, also has played games with Ella Joy, has danced with Ella Joy, has watched Ella Joy open gifts, has probably felt pain from bouts of laughter inside the Won house. It’s a 52-mile trip from Lake Forest to South Elgin. Two other Battle Buddies at LFHS are seniors Tate Dahlgren and Collin Thiergart. 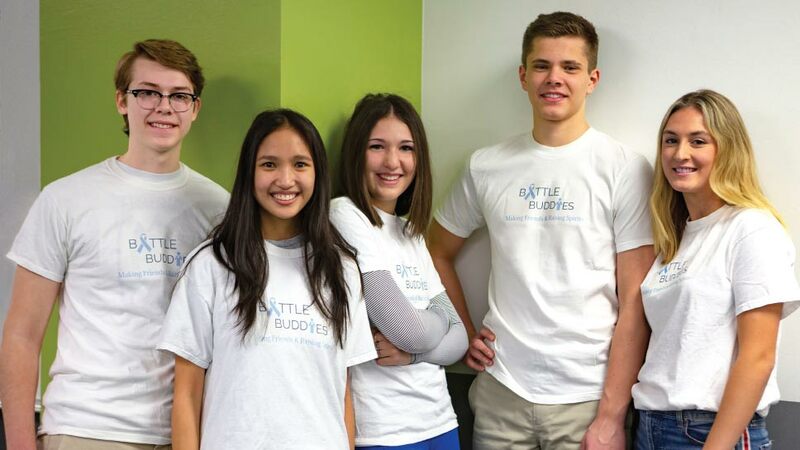 Dahlgren essentially told a room full of adults at the 2018 INCubatoredu National Pitch Competition in Chicago that a pediatric cancer patient’s happiness is Battle Buddies’ first and last priority and all of the ones in between. Simple as that. No need for a complex metric. Battle Buddies’ Trooper No. 2 is a 13-year-old from Glenview, Trooper No. 3 a 5-year-old from Lake Forest. The group received $10,000 in donations at a Pfizer Trade Show last October. “We want more troopers and more opportunities for our buddies to brighten kids’ days and make their weeks; finding troopers—that’s our biggest struggle,” admits Abdallah, whose father, David, died of cancer at the age of 51 last November. Her mother, Julie, also has cancer. “We want to get the word out,” she adds. Battle Buddies’ most appreciative fan older than 9 is Ella Joy’s mother, Anne. One hour, maybe less, after Battle Buddies’ first two-hour visit with Ella Joy, Anne texted a question to Abdallah and Leeson. It also allows Ella Joy to exercise her brain. Many of the games she plays with her buddies for life feature learning elements. Her buddies are smart, Reason No. 517 (unofficially) why Anne and her husband, Mike, are staunch proponents of Battle Buddies. Cancer treatments took quite a toll on Ella Joy, her young brain powerless to shield the regimens. She underwent radiation—the max. Unable to attend school in 2017-18 because of her condition, Ella Joy completed third grade under the guidance of a tutor. It was a serious line on the list. It was worth pursuing. The group then thought of youngsters with cancer, alone and scared and friendless, in hospitals. They sure could use a respite from all those doctors and nurses and other adults. The five Business Incubator students hit a Starbucks in Lake Forest to come up with a name for their project, putting their heads together and visiting thesaurus.com more than once. Abdallah liked how friendly ‘buddy’ sounds. Battle? That fit. Battle Buddies. You can’t go wrong with alliteration, right? The interview and photo session with the five Battle Buddies nears its end on a February morning at LFHS. Abdallah had received a text message, at 8:59 a.m. It was an invite to a birthday party on April 20. A trooper—a brave girl, a true hero—turns 10 on April 21. Buddies could not wait to travel the 52 miles for the big day.